I’m generally a pretty big fan of OMM gear, and have been since their KIMMlite days. Light, no nonsense kit, and not afraid to innovate. When they brought out a fully waterproof softshell, with their own Gelanots fabric, I was intrigued and bought one. It did well for a couple of years abuse, eventually dying as a result of a crash on my bike, and a victim of the stretchy nature of the fabric, meaning the seam tape prematurely peeled away. I was happy enough to go out and buy a new one though. In the intervening years, OMM had spent some time developing the second generation of their smock. This had new, nice feeling, but less stretchy fabric. I bought one, and got on we’ll with it instantly. As a light, minimalist top, I didn’t use it frequently, but it was near perfect for the job it was designed for. The only minor flaws were slightly too-short arms and a peak that would have benefited from wire. It was a sad day then, when before Christmas, the jacket failed. I was out running in the Peak, in pretty vile conditions, which took a turn for the worse. I tugged the smock on, back to the wind. Upon zipping it up, something wasn’t right. The zip briefly jammed before running free. The teeth on one side separated from the zip fabric, and left me with a zip that would not stay done up. Great. Luckily, I had an easy escape option, and headed straight down, jacket inflating with cold wind rushing in through the gaping, billowing fabric. Now, I’ve had the smock for three years (I bought it at the 2009 event). A reasonable length of time, but I really hadn’t used it a great deal. Disappointing. OMM weren’t willing to offer any form of replacement (it would have been nothing more than a good will gesture), so I’ve been left looking for a replacement lightweight waterproof shell. This left me with a few choices, largely either Haglofs, Montane or Berghaus, with a few outside contenders, like The North Face (who seem to have come through their “look GRRR on the high street years”, and started turning out lovely kit again). In the end though, a bargain deal meant I have gone with another OMM product. Their eVent jacket, in a fetching canary yellow. First impressions are good. Sleeves are longer, everything else is right. It’s maybe a little baggy in the body, but I can forgive that if it performs. Andy from OMM here. The Kamleika zipper above is a lightweight zipper to provide best service in a lightweigt jacket. We have not had the chance to inspect the zp to check whether the issue is a fail on the zipper or the zip being subject to stress. The zip is quite hard to replace and it is rare that this is required. Lancashire Sports Repairs would be the comapny we would recommend for this type of repair. I wasn’t given the opportunity to return the jacket to you for inspection – I rang OMM and was informed I could only pursue the issue via the shop I’d purchased the item from… Except I’d bought it direct at OMM 2009, so wasn’t able to. It was also out of your warranty period. As I mention, it’s a shame, because I’d not used the jacket often, treating it like the lightweight item that it is. I still use other OMM gear, and rate it highly, and indeed – the Kamleika smock was great while it lasted. I keep meaning to send it off to Lancashire Sports Repsirs, but haven’t got round to it, as I needed to replace the jacket in a hurry this winter! Hey – I have a similar issue – only with the fabric itself. I’ve been in touch with OMM via Email – but heard nothing. 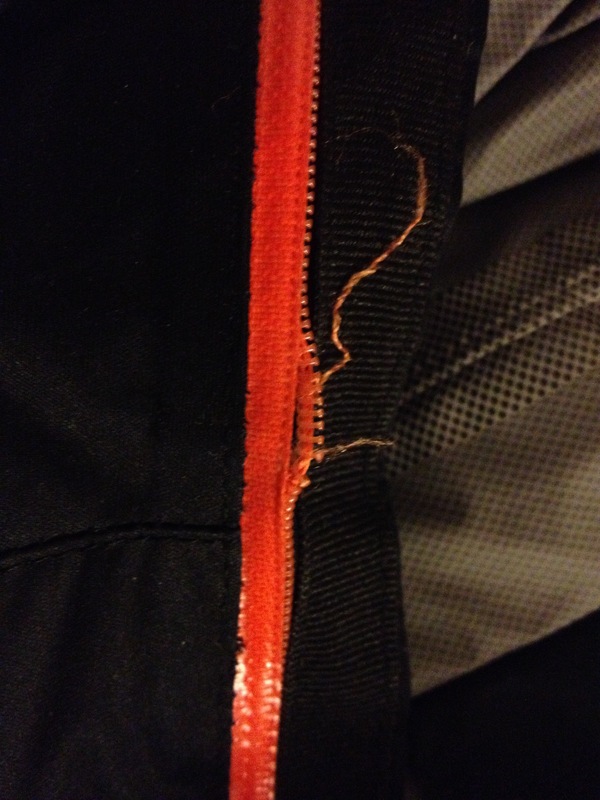 I bought my jacket last year (Oct 2012), and since then it’s had – light > medium use (I got an Achilles injury which led me to stop running for best part of 7 months) – Last week I discovered a tear, at the seam, on the shoulder, near the hood… This has led to fraying of the upper fabric, and the lower fabric detaching. Obviously this isn’t ideal – particularly now I’m back in training and the weather is turning. I’m a big fan the Jacket – so much so, running buddies have also been and bought them. Hi Pete, no record of your email in the system, if this has been resolved subsequently great, if not send us a mail through the website using contact us with details and we will look into it. All sorted buddy… (I got them replaced via the seller) Cheers. That looks like a Cypher jacket you’re wearing in the last photo. 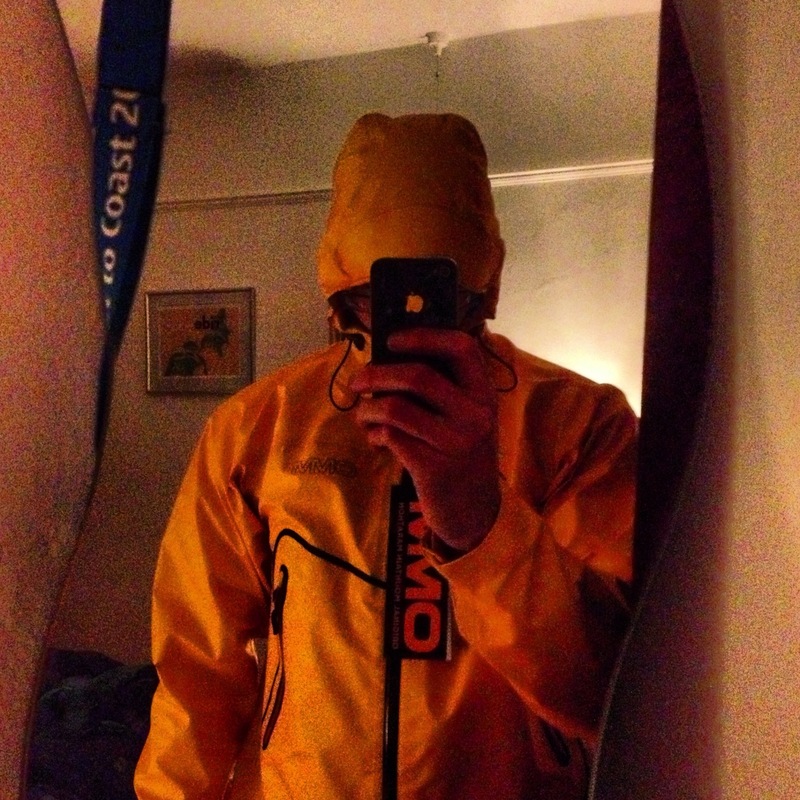 I just grabbed one off eBay for £100 – really pleased with it so far, it has a nice, not-too-baggy fit and the yellow works well for being seen whilst cycling, as well as being an appropriate colour for hiking (which hi viz colours aren’t), which are the main reasons I bought it, as well as wanting to try an eVent jacket for a change. How has the new jacket performed in the months since you bought it (durability/ breathability/ waterproofness)? I’ve had the Cypher for over a year now. I’ve been generally really impressed with it, for all the reasons you mention. I’ve used it for biking and running in some pretty horrible conditions, and it’s done everything you would expect it to. Few things to watch out for: my zip took lots of “breaking in”. I found it impossible to do up with cold hands until it had worn in a bit. It was my first experience of eVent too. I like the breathability and waterproofing, but it has now started to delaminate quite badly… To the point it is no longer completely waterproof. Some of the seam sealing is now starting to peel away too. Overall though, I’ve been really happy with the jacket. Maybe a bit disappointed longevity-wise, but it’s had a hard year.